To find out more information about our products, gets tips and tricks or to find out about our shipping or terms & conditions you can find your answer quickly below. How do I deal with Box Blight? First of all if your an RHS member send a sample of to be tested to sure thats what you have, if confirmed make sure all tools used for clipping are disinfected before & after. Consider what time of year your clipping Box Blight tends to be most active during August, September & October. I often clip Box Blight affected plants in the Winter when its colder the spores are less active. Consider the use of a non chemical product like Topbuxus Health Mix. Whats the difference between the Bahco Secateur Blade sizes? No 1 is the finer blade suitable for cutting up to 15 mm diameter stems & twigs. No 2 Blade is the general purpose blade suitable for cutting up to 20 mm twigs & woody material and No 3 Blade is suitable for cutting up to 30 mm for woody material and small branches. What's the advantage with Secateurs with rotating handles? I have been using these since starting work in 1984, they do feel strange to start with but you soon get use to that. Its claimed it takes up to 30% less effort to cut the same size woody stem with a rotating handle version. From experience I have found you do get less blisters! Why don't they make Secateurs for left handed people? It’s a sad fact that most left handed gardeners don’t realise they have been making these for many years. We stock these in both the Bahco and Darlac brands covering a range of price. Do you stock spare blades for the pruning saws you sell? Yes I keep spare blades for all the saws we sell. I use all the saws we sell in my other gardening business on a daily basis so I do keep a good stock of them. I consider the Bahco 396 HP to be the best small folding pruning saw on the market. When would you use Jute or Flexi Tie? As a rule of thumb I tend to use Jute if I only want the knot to last up to 12 months for example on Rambler Roses which I know I will be pruning & retying each winter. If I am wanting the knot to last much longer than 12 months I use Flexi Tie – the hollow plastic string which stretches as the plant grows. I sometimes use Flexi tie for knots required for under 12 months if there is a lot of tension required to hold the stem in the place you desire. Handy Tip for Jute is to keep it in a tin with a lid on it with the string feeding thru a hole in the lid. This keeps it dry and stops it getting tangled. Also use Arthurs Royal Knott a great way to tie in plants and save string see the video here or ask me to show you the knot at one of the Plant Fairs & Flower Shows I will be attending. Which width of Flexi tie should I buy? The narrow one at 2.5 mm is suitable for use with Herbaceous work and tying in small climbers like Clematis. The 3.5 mm is the general one and good for a wide range of plants, I use it for climbing and Rambler Roses, smaller Wisteria stems etc. while the wider one at 6 mm is good for tying in trees, very large rose stems and the heavy stems like older Wisteria’s. What makes Uncle Peters Trowels different to others I have seen? Several things! they are made from Copper & Stainless Steel so wont rust or rot if left outside. There is no joint to snap or break, they are very nicely balanced in the hand so easy to use. The narrow blade makes it much easier to push into firm ground or turf if planting bulbs or taking out weeds. I was given one by a client as a gift and just didn’t stop using it. They also make great gifts for gardening friends! Do you use these products yourself? I do indeed, I am a professional gardener and use a range of these products daily in my other gardening business www.atpgardening.co.uk I am using my experience over 30 years to bring a range of products to this online shop which I can recommend for different uses over a good price range to suit a variety of budgets. Why is Vitax Q4 such a good fertiliser? Most fertilisers provide Nitrogen,Phosphorus & Potassium as does Vitax Q4 but it also provides a source of various trace elements like Copper and Boron in small amounts for a balanced fertiliser. Often when these small trace elements become low in the soil the take up of NPK can be reduced often making a plant look ill with a loss of colour. If a bed has been over used or covered in a very hungry plant like a conifer an application of Q4 will readdress the balance of nutrients. How do I create a good bushy dense dwarf box hedge? Assuming you have planted your line of box plants at the correct time of year from November through to March, I would give them a trim the following Autumn. Do not attempt to get nice straight sides with the first cut, instead cut your plants into an “A” shape looking along the line of the hedge. This allows light to reach all parts of the plants giving even growth, it also cuts those dominant vertical shoots which cause’s the plant to side shoot helping to fill out the bush. In the following spring give them a feed with Vitax Q4 and if time allows make two cuts a year, one in mid June the other from mid September onwards keeping to the “A” shape. Each time you cut never leave more than a third of growth on the plant this will also help to thicken the plant until you have reached the desired height. Keeping cutting to the “A” shape until the bottom of the hedge is filled out. Once this is achieved gradually allow the side of the hedge over several years to become steeper until vertical and you have a nice flat top and bushy dense hedge. 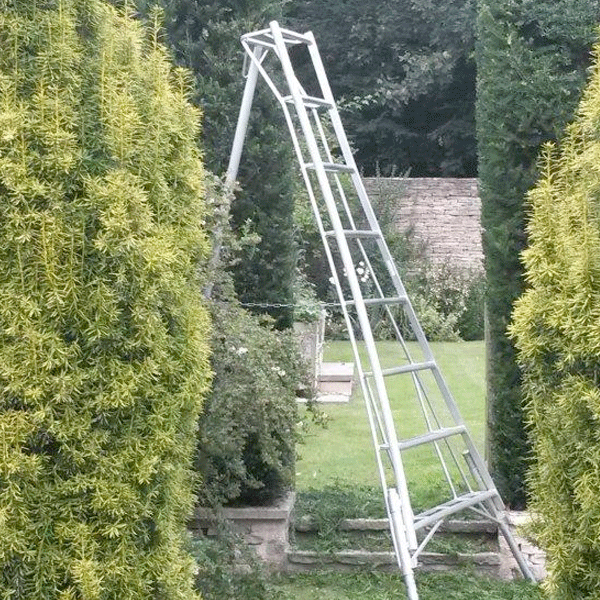 Handy Tip once your hedge is complete each time you clip it put a 45% chamfer between the sides and the top will really smarten your hedge and stop the top of the hedge from splaying outwards. Any tips on producing an individual piece of Topiary? Think about what you want to create and what might be best to clip it out of. Finer detail will require a smaller leafed plant like Box or Yew. If growing a pair of standards really examine the plants as exact leaf forms can vary quite a bit in both Evergreen, Oak & Yew ( often difficult to spot when young but can look so disappointing when mature). Its very important to choose plant material with just one good strong leader in the middle of the bush, this can’t be stressed enough. This is vital when trying to produce a piece of Topiary that has bare patches of stem like the wedding Cake forms, if it has more than one stem or you leave more than one stem it will result in some very difficult decisions in the future.